A woman is going public with accusations of sexual misconduct against a South Bay political leader who is seeking an even higher office. Robert Handa reports. A woman is going public with accusations of sexual misconduct against a South Bay political leader who is seeking an even higher office. 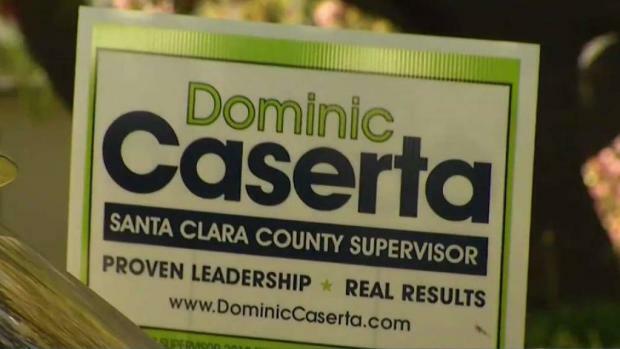 Santa Clara City Councilman and teacher Dominic Caserta has been losing key endorsements in his bid for county supervisor because of sexual harassment allegations. When Caserta spoke to NBC Bay Area on Wednesday, he said he felt he had been cleared of allegations made by students and a campaign worker. On Thursday, that campaign worker told NBC Bay Area a very different version of their relationship. Past sexual harassment allegations are coming back to haunt one of the frontrunners in a Santa Clara County supervisor race. Robert Handa reports. "His touching was not appropriate," said Lydia Jungkind, who was a political science student of Caserta at Foothill College before joining his supervisor campaign as a volunteer last fall. Jungkind quit soon after, claiming Caserta sexually harassed her constantly. "He was touching my legs, my thighs, my hips," Jungkind said. "He was kissing me on the cheek. He made inappropriate sexual comments." Late Wednesday, Jungkind filed a complaint with Santa Clara police about Caserta. "We live in 2018 and I can't believe there are still guys like him around that think they can get away with anything," Jungkind said. NBC Bay Area has learned there have been multiple calls to police about Caserta since the city on Wednesday encouraged possible victims to come forward. Santa Clara Mayor Lisa Gillmor has set up a Tuesday public hearing about Caserta's future, which could end that night. "A lot of members of the community believe that Councilman Caserta should resign," Gillmor said. Caserta declined to address Thursday's allegations directly, but maintains his innocence. "I have done nothing wrong, and I do apologize if someone perceived that I have," Caserta previously told NBC Bay Area.